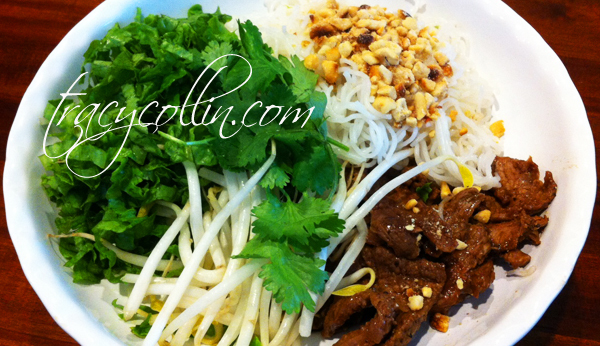 This tasty dish is by far the easiest Vietnamese dish with little prep and cooking time ! * I haven't try yet but I'm sure tofu or shrimp would be a good substitution for meat too. ﻿Veggies (You can use any of these or opt out altogether): lettuce, mints, basils, cilantros, bean sprouts, pickled daikon/carrot strips, or cucumber slices. - put vermicelli stacks in a pot cold water. Put the pot on the stove and bring to boil (2 cups of water for every 1 stack of vermicelli). Check your pot of vermicelli ! Once it's a rolling boil, turn off the heat and leave it there to cook for another 5 min. Test for doneness by breaking off a strand with your index finger and thumb. If breaks off with a light pinch then it's done. Drain the vermicelli in a colander. 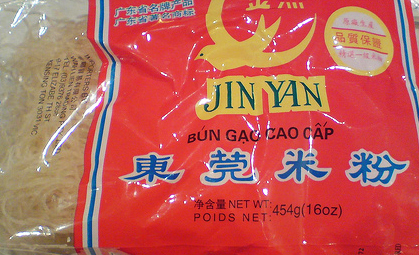 This is the only brand I use (just look for package with yellow bird at the market), it has a nice chewy texture. Meat: In a non-stick pan, put in the cooking oil, then add the smashed garlic (and ginger if using), stir around until fragrant. Put in the meat and cook until no longer pink. Pour in a some vegetarian mushroom sauce ! stir and taste to your liking. 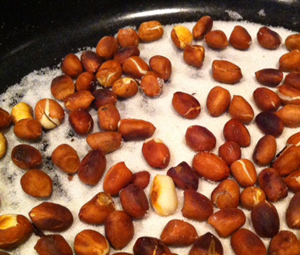 Roasted peanuts: In a pan, on medium heat, pour some salt in, enough to line the pan. Then put in the dry raw peanuts and let it roast on top of the salt. Stir around a few times. Once the outside red shells cracked, and the inside peanuts are a golden color, remove from heat. Pour onto a sieve to rid the salt. Rub the peanuts with your hand to remove the outer red shells. and put the peanuts into a mortar. Gently crush with a pestle. In a pasta bowl, put all the ingredients next to each other (like the photo at top). Or if you prefer layering them, line the bottom of bowl with the green veggies, then vermicelli, top off with meat, and sprinkle with the crushed peanuts. Before you chow down, pour some Vietnamese dipping sauce all over ! Enjoy ! Nom nom nom !